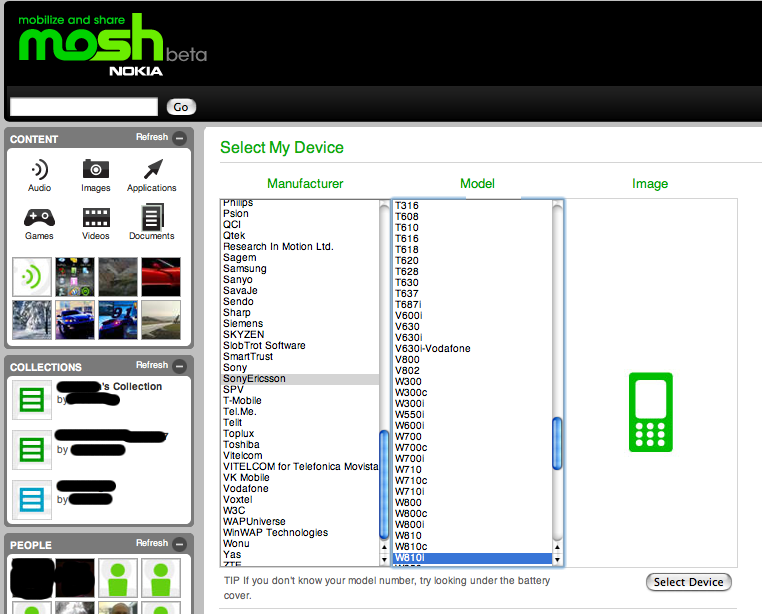 I had just posted about Nokia MOSH and it’s a restricted beta, luckily I already got my password to access it. I created an account and uploaded my first content. I was really testing the site in parallel on my Mac and on my mobile phone. Very first impression is that it’s an interesting new social site. It has all the common features such as upload a photo, invite a friend, exchange messages. The first question that comes to my mind is “So what’s new?”. Not very much I’d say, if you don’t consider that it’s made for mobile devices first and ALSO features a web interface. The main concept here is to be able to upload contents from your mobile device. This is nice and probably Nokia’s commitment is promising, but I don’t see it SO different from what Flickr Mobile has been offering for a while or even ShoZu. I believe they are using WURFL. Not very hard to guess since it’s free and very well supported by many developers, but at the same time you might expect a different approach from Nokia. Are they using WURFL as-is? Did they patch and optimize the Nokia devices? Are they going to give back to the community? How can I say it’s WURFL? If you look at the screenshot you can see a few things that hinted this to me such as “Research in Motion Ltd” instead of “RIM” or “Blackberry” that are much better known names than the complete company name. Another thing is the duplicated “Vitelcom” and “VITELCOM for Telefonica Movistar”, I remember adding those values and wondering if they should be merged or not. Then there are a few brands that you would not expect to be possible to be picked from a list of devices such as “W3C”, “WAPUniverse” and “WinWAP Technologies” (the first one is obviously not a device manufacturer and the other two are companies selling a browsing software). Also, if you look at the list of Sony Ericsson devices, you can see the “W810”, “W810i” and “W810c”, but the “W810” does not exist, it’s a virtual that device we defined in WURFL and the different localized versions (i for Europe, c for China and a for Americas) inherit from it most of their capabilities if not all. Going back to the service, I liked that once I completed the registration it suggested to point the browser of my mobile device to a mosh.nokia.mobi. Accessing the site via your desktop browser provides the very same interface… Since they have a version optimized for desktop PC’s it would be good to be automatically redirected to the other version OR have a link. Nokia, if you are reading, I suggest you use is_wireless_device from WURFL. One bug that I already found was that when trying to upload from the mobile, I could specify the tags. There was no mention of how to do it, so I used commas as on blogger.com, but this did not work, so the upload was not successful. Since I was using Opera, I could not pick a file from the filesystem, but I had to use the camera, so I had to take another picture and, even worse, some, but not all of the information I had provided was lost such as the tags (of course) and the content title. This one needs to be fixed. is the site able to recognize the device while browsing and let me know which contents will be appropriate? Using Opera Mini it did not seem to pick it up correctly (but the pages looked very good). how will they be able to keep out pirated contents. I have uploaded one image and it is now waiting for approval, but still I can’t imaging people at Nokia testing all the applications on any possible device. Open-Source as in “work for free”? It seems like I really can’t sleep tonight. Too many thoughts rambling in my mind and sleeping is probably the last thing I can do. I will try to tire myself until I fall asleep on this chair writing something here on the blog as I haven’t been really good at writing in the last few weeks. Coming back to the subject of this post, a few weeks ago I was browsing and for some reason I stumbled upon Ari Jaaksi’s Blog, a Nokia guy that follows the development of the N800 among the other things. Specifically I read about the development on the N800 and Ari gave his Status Report regarding the available software. What strikes me is that the N800 is already on the market (and so was at the time of the article) and Nokia is asking people to do some open-source development to add software and features that were present in the N770, but that Nokia could not make work for the N800 in time for the launch. I am a big supporter of how Nokia helps developers and I think they are the best in the mobile space, but honestly, this really seems to me like asking the open-source community to take over some development that Nokia could not or did not want to do. I don’t think this is fair to the developers that will eventually do the work (if any). They are effectively working for free to give some more profit to Nokia. It’s an open call from Nokia to ask for free support. One thing is to develop a software and open your API (and maybe eventually making some money out of this as Google does) another thing is to ask someone to do the work you did not want to do and also expect it to be free.